At Sanitarium New Zealand, our Weeties are made by steaming, rolling and toasting wholegrain wheat kernels to golden perfection. 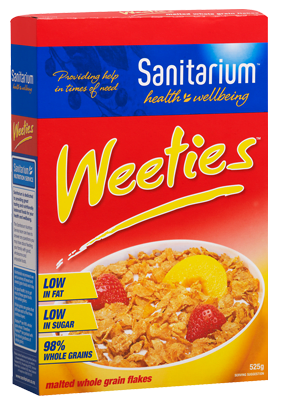 Weeties are 98% wholegrain, low in fat and sugar, and are a simply delicious way to get some of the nutrients you need. 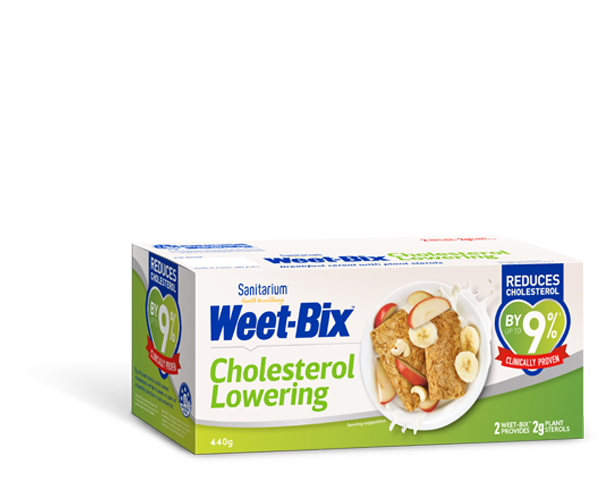 These golden wheat flakes contain fibre to help keep your digestive system moving and carbohydrates to help provide energy for the day ahead, as part of a balanced diet and an active lifestyle. So, this morning, as you enjoy your bowl of Sanitarium Weeties, you can be sure you are starting your day the right kind of way. The Health Star Rating of a product is based on a calculation that considers the amount of energy, saturated fat, sugars, protein and fibre present in a food, along with the fruit, vegetable, nuts and legume content. Wholegrain wheat (98%), salt, barley malt extract. Contains cereals containing gluten. May contain soy, milk, sulphites and treenuts.